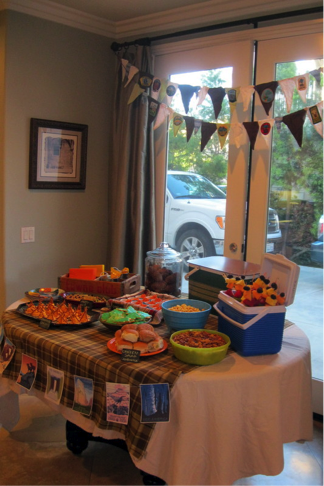 A couple of weeks ago I helped put together a baby shower for my friend Anne. Anne and her husband have a little girl and will soon be adding a baby boy to their sweet family. Their family loves going camping, so when deciding on a theme, camping was the obvious choice! A good friend graciously allowed us to invade her beautiful home (thanks, Lesily!). Finding decorations was really simple and most things were just pulled from my house. I raided my fall decorations and came up with a plaid tablecloth and runner. I used a wooden crate to hold napkins and cutlery. To add height, I brought a vintage green picnic basket and a large glass jar filled with pinecones. My friend Jodi showed up with her cooler filled with fruit skewers (and she says she isn’t creative!). The food was amazing! (I can say that since I didn’t make any of it!) 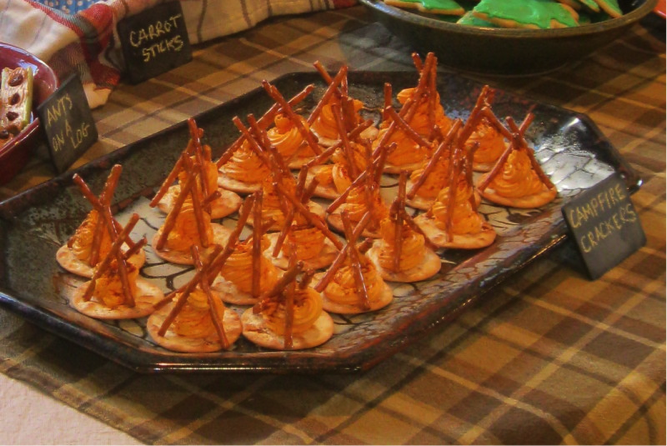 I loved the crackers topped with cheese and pretzels to look like mini campfires. The pine tree cookies were too cute (how do you get them to look like that?). 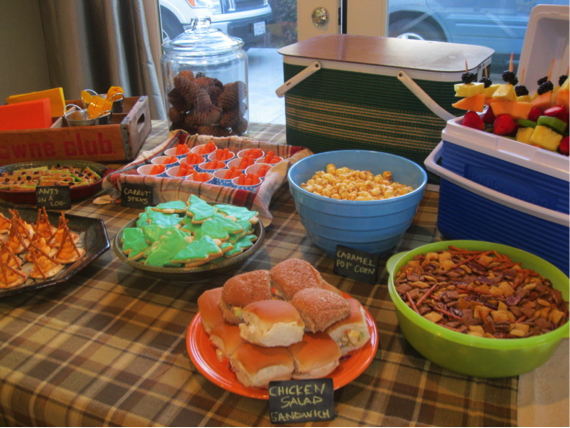 The sandwiches were yummy, too! I have super talented friends. 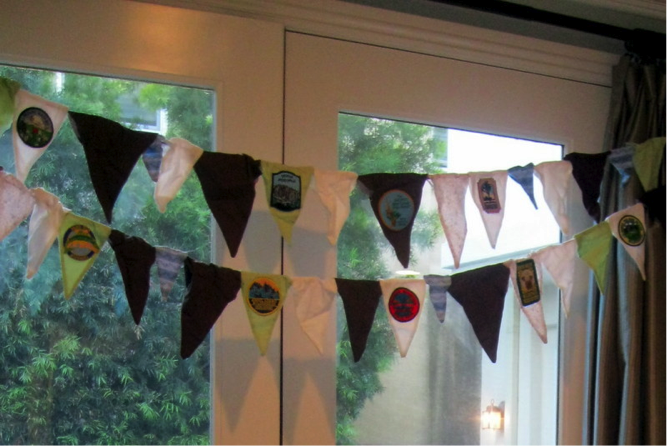 Anne allowed us to use a pennant banner she handmade for the baby’s room. It was so sweet to display her handiwork. She sewed on patches from different places she and her husband have hiked—such a sweet personal touch! 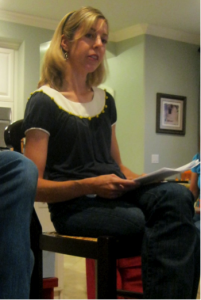 After enjoying the food, we were treated to hear Molly share a devotional about praying boldly for our children (she will share more on the blog about this later this month!). Then it was time for presents! Anne got lots of great things—lots of organic baby items. The night ended with us all going outside and making s’mores around a fire pit. 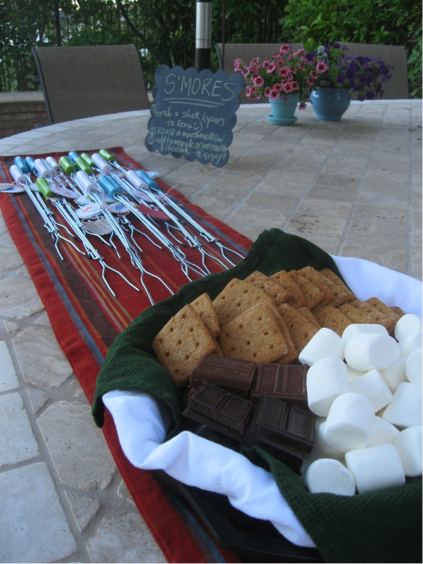 These s’mores were the best I have ever had! Seriously. Tami made homemade graham crackers and I cannot tell you the difference that made! I never want a store bought graham cracker again! We set out pokers for each guest which did double-duty–we used them on the spot to roast marshmallows and everyone got to take one home as their party favor. I loved sitting and laughing with my friends and seeing the warm glow of the fire on their faces. I am so blessed to have such dear friends who can surround and support each other. 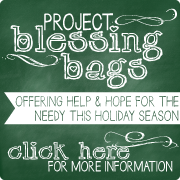 God has given us all different gifts and I love how He brings us all together to use them. Now I am just waiting to meet Anne’s son—I can’t wait to hold him! for a kid’s summer birthday party, too – especially a sleepover! I’m going to file that one away..